Vellido, A.; Cruz, R.; Giraldo, J.
Cruz, R.; Vellido, A.; Giraldo, Jesús. Advances in semi-supervised alignment-free classification of G protein-coupled receptors. A: International Work-Conference on Bioinformatics and Biomedical Engineering. "Proceedings of the International Work-Conference on Bioinformatics and Biomedical Engineering 2013". 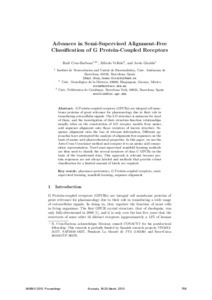 Granada: 2013, p. 759-766.